While William Penn was parceling up Pennsylvania for the first generation of European settlers, England’s system of land use was undergoing a fundamental shift. Since medieval times English agriculture was for the most part practiced communally, employing an “open field” system in which each community had a few very large fields which were divided into smaller strips to be farmed by individual families. Likewise, livestock grazed on common pastureland and the right of common use extended to lumber harvesting, fuel gathering, pig foraging, berry picking, and any number of activities essential to the community members’ subsistence. 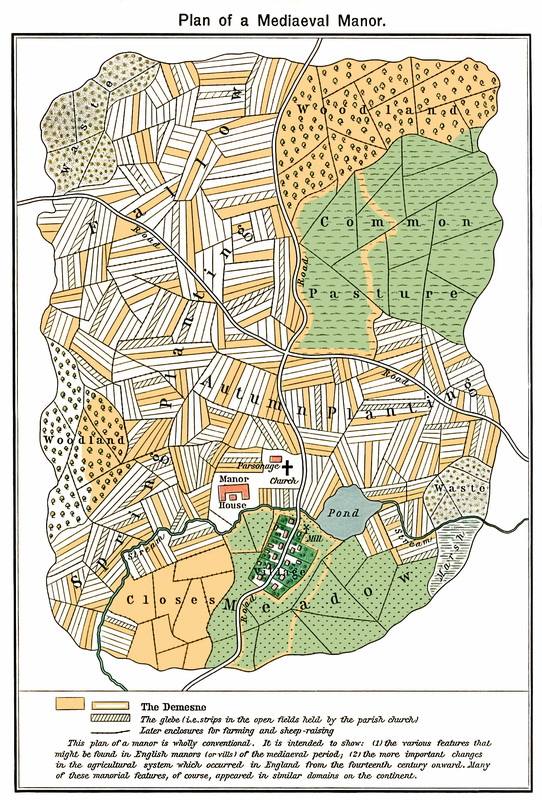 The Manor, as it was eventually laid out, and the plantations of the earlier settlers, with the lines straightened in accordance with Penn’s wishes, are shown on Holme’s map of 1685. Penn, in compensation to the landowners whose boundaries were changed by the adjustments, granted a tract of 120 acres to the inhabitants of the area which was later established as Falls Township, as common land. This tract, not indicated on Holme’s map, came to be known as Falls Common, but was also known as the “Great Timber Swamp.” The Common was located in the Middle Lots between the village of Crewcorne and the spot where Falls Meetinghouse was built in 1690 forming the nucleus of the village of Fallsington. Since it was a large tract of undeveloped land, the Common formed an effective barrier between Crewcorne and Fallsington. Given Penn’s personal intercession to control the use of the land and its apparent short life, Falls Common may not have played a formative role in the development of early Buck County. However, it is interesting to note this relict of medieval communalism in a pattern of development primarily defined by the allotment of land to individual owners in fee simple.